Belgium had been a constitutional monarchy since it gained its independence from the Netherlands in 1831. As Belgium occupied the only wide open space between France and Germany, its neutrality was a vital component of the European balance of power. The foreign policy of Albert I, who had ruled the country since 1909, was to maintain a neutral stance between its two powerful and antagonistic neighbours and did not join either the Triple Alliance or the Triple Entente. In 1914 Belgium had a population of around 7.5 million. A prosperous trading nation, with major ports at Antwerp and Ostend, Belgium had good supplies of coal and iron and an efficient railway system. Belgium had universal male suffrage but the well-educated and wealthy were allowed up to three votes each. In 1914 power was held by Baron de Broqueville and his Catholic Party. 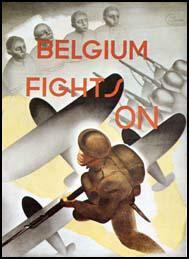 Belgium had a small regular army of 43,000 men with another 115,000 trained reserves. The Belgian Air Force had only one squadron of 12 aircraft. A total of 267,000 men served in the Belgian Army in the First World War, of whom about 54,000 were wounded and 14,000 killed. The fascist Rexist Party, led by Leon Degrelle, was established in 1930, and expounded policies of Anti-Semitism and anti-Communism but was rejected by the Belgian electorate. Under the supreme command of Leopold III, the Belgian Army fought against the German Army when it invaded the country on 10th May 1940. However, without tanks, and very few aniti-aircraft and anti-tank guns, the government was forced to surrender eighteen days later. Leopold III was arrested and interned in Belgium. Later he was moved to Austria and Germany. General Alexander von Falkenhausen became the military governor. The Rexist Party supported the new government and the resistance was active in Belgium. Falkenhausen disapproved of Nazism and made some attempt to limit the arrest and murder of Jews in Belgium. It is estimated that two-thirds of the country's 90,000 Jews survived the occupation. By the time that Belgium was liberated in 1944 Falkenhausen was himself in a German Concentration Camp. After the war Leopold III was accused of collaborating with Adolf Hitler and a referendum in Belgium voted against his return to the country.